As with previous trips, the fun part of the night time is going to a restaurant that you have no idea about, in a place where it is difficult to get a grasp on where is good and where you should be looking. Don’t you dare tell me I can’t go into a pub, Irish no less, and ask for a Shepard’s Pie – it wasn’t like I was on holiday from the UK, was it? I wouldn’t have entertained the thought if we had been coming from the Uk, but I’d not had a meat pie in a long time, and the temptation was too great. The pie was excellent actually, with good pastry, nice fluffiness to the meat and sauce mixture, and to be honest it made me a little homesick. The big downer on the evening was the desert which was a barely palatable dry chocolate cake thing that didn’t do any favours for the rest of the meal. It was met with copious amounts of Guiness, but an early night beckoned because of the 3am wake up call required to make it to the East Coast. On the night of our secret trip to see the Phantom of the Opera we decided to go in a different direction from the previous night's endaevours. The main reason was that our hotel, on 34th Street, was 10 or so blocks from the Theatre which was up in the 40s. So, heading North, we also moved two blocks West of Broadway looking for something small, quiet and "cheap" and, seeing as it was my choice, we went to a small Italian. I initially asked for a "large pizza" with the waiter almost slapping me full in the face with stupidity "it's a-big-a, signore" or something. Anyway, when it came it was already massive - too big, so I have no idea what size a large would've been. We also had some starters this time, but I can't really remember what mine was, but it was great. Oh yeah, mozarella and oil. It was a lot better than I have just made it sound, I promise. Wine was great and afterwards, I swigged a 12 year old MacAllan as Connie and darted into a pub to use the facilities. A Place called Hells Kitchen - STEAKS. The last night was to be Connie's choice, but we kind of mutually agreed that this place looked very much like what we would were into right at that moment. We both had a good drink - I drank Hienniken, Connie slurpped some Cosmopolitans and we ate like kings - each order a steak, Connie's came with fries so we each ordered Green Beans and Asparagus which were amazing. Connie had never ordered a steak before, so we really enjoyed eating it, her eyes lighting up with glee at the amazing tastes of the soft, perfectly cooked steak. It really was one of the best steaks I have ever had, and the restaurant was pretty good too - though our waiter kind of forgot about us a few times, but hey, it was probably for the best that I didn't drink too much beer. Also, the place showed An Idiot Abroad, so that was good. 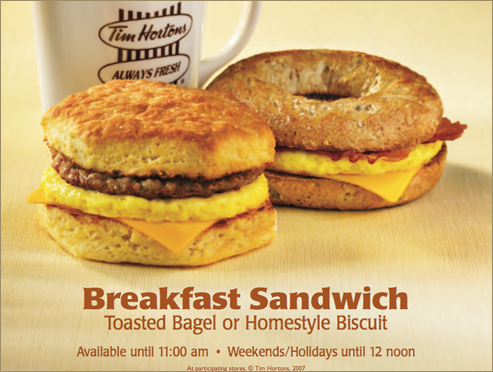 Okay, so Tim's is pretty amazing. It does Coffee and doughnuts and that's all you need to know - mine is a large regular in Canada, but in New York City that order gets me a lukewarm gallon tub of some coffee tasting water. My doughnut is a Chocolate Dip in Canada, but in New York City is is like someone tried to make one from a fax machine version of the doughnut it's self. After two underwhelming breakfast sandwiches and the worst cusomter service I have ever had, we admitted that whilst it said Tim Horton's on the outside, the heart and soul had been lost in the transfer over the Canadian-US border. What it is supposed to look like. It did not look anything like this. For example, whilst making my Sausage Egg and Cheese breakfast bagel, that should look like the above, she managed to leave the plastic wrapper on as she toasted it with it burning into a small plasticy flame before trying to serve it to me. I refused, and in return I got a single bagel with only a sausage slice. After I went and asked for a proper sandwich, she muttered that "she [Connie] had ordered a bagel and sausage" to which I said, in my most prompt and British sounding accent in full blown PATRONISE mode, "No, she actually said a 'Breakfast Sausage Sandwich on Bagel' and I heard it because I was standing right here" or something to that affect. "Food", "Holiday 2011", "Holiday", "new york", "tim hortons"